. Your cart will total 222 points that will be converted into a voucher of $222 towards your next purchase! Must be logged in to collect points. The DR 190 Stainless Steel Refrigerator is a double-drawer refrigerator in stainless steel design with two separate fridge drawers providing practical adjustable interior equipment. The DR190 is equipped with a fan-cooled compressor mounted on the rear side. The DR190 is delivered with a three side flange for flush mounting. Isotherm Drawer Refrigerators and Freezers feature user-friendly design, high quality materials and robust construction to ensure long service life in the marine environment. 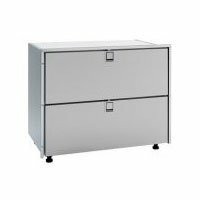 The Isotherm Drawer 190 Stainless Steel (INOX) is a double-drawer refrigerator in stainless steel design with two separate drawers providing practical adjustable interior equipment. It is equipped with a fan-cooled compressor mounted on the rear side and delivered with a three side mounting frame for flush mounting. The DR190 provides commercial quality design for on board chefs with stainless steel trays and bins to keep refrigerated foods ready to go for fast food preparation. Unlike ‘landlubber’ fridges, Isotherm uses Danfoss/SeCOP compressors that are designed to work at angles up to 30 degrees (rail under) for days or weeks at a time. Plus, Isotherm backs all compressors with the exclusive Isotherm 5-year limited warranty as well as 2 years on all other parts. Total Volume / Capacity: 5.7 cu. ft.